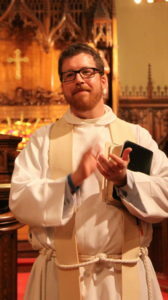 The Reverend Jered Weber-Johnson was called to St. John’s to be the Rector in the spring of 2011 – and as he describes it, coming to St. John’s was like “coming home.” As the priest in charge of the parish, Jered oversees the operations of the church, the staff, the finances, and fundraising, as well as the spiritual life and care of the congregation. Jered also preaches regularly, teaches, celebrates the Eucharist and presides at other worship along with our associate rector, does regular pastoral care, and chairs vestry, the lay governing board of the parish. While Jered relishes all the opportunities that leading a congregation like St. John’s presents – setting a vision, connecting members to their own individual callings, and cultivating the mission of the church – his deepest passion is walking with people as they discover the depth of God’s love for them in their relationship with Jesus Christ, and helping them unlock how they can share that love and relationship with a hurting world. You might want to connect with Jered to talk about life transitions (weddings, funerals, baptisms, confirmations), to discuss your vocation or sense of calling, to confess or to receive pastoral counseling. Before moving to Minnesota, Jered served at St. Alban’s Episcopal Church, which is located close to the National Cathedral in Washington, D.C. Previously, Jered also served at St. Paul’s Chapel at Ground Zero and Trinity Wall Street in New York City. While in New York he received his Master of Divinity from The General Theological Seminary. Jered and his wife Erin were sponsored by the Episcopal Diocese of Olympia in western Washington, to serve as missionaries with the Episcopal Church’s Young Adult Service Corp in northern Taiwan. Jered was born in Bemidji, Minnesota and moved when he was six to Prince of Wales Island in southeast Alaska where he would grow up and graduate from high school. Jered received his bachelor’s degree from Greenville College (Greenville, Illinois) where he studied Communication and Religion, ran track and cross-country, and (more importantly) met and married the love of his life, Erin Weber-Johnson. They have two very energetic and quickly growing boys Jude (b. 2009) and Simon (b. 2012).